If you are pretty familiar with Java development, this post will seem silly to you. But I’m not. Many times, you can learn a lot from failures as well, so this one I’d like to document. Basically, I had gotten a command prompt as a lower privileged user on a machine. I was looking to get administrator access somehow, and I noticed that Java 7 Update 4 was running, which is vulnerable to CVE-2012-4681. You always hear of this one as a “privilege escalation” exploit, so I thought by popping out of the Java sandbox, you’d also pop out as an administrative user. News flash. It doesn’t work that way. The exploit works, but you pop out of the sandbox as the same user as you ran the command. I’m going to explain how to do it anyway. Those Java developers can stop here, but the rest of us might still learn something. What do I start out with? Most exploits are captured via twitter, or some sort of pastebin website. Usually with twitter linking to a pastebin, which is the case here. The source code was tweeted by @jduck1337 pointing to pastie.org/4594319. Grab the source code from there because that’s what we’re going to start out with. Also, don’t forget to install a vulnerable version of Java. Any Java 7 version at revision 7 or below should work. I have my code, now what do I do with it? You can see the class is called Gondvv. So you’ll need to save that file as Gondvv.java. Then erase that first line that says: package cve2012xxxx; This will be a standalone file, not a package. You’ll notice a bunch of jibberish, but near the end of the file you’ll see the purpose is simply to open calc.exe. So no worries – the code as it stands is not actually malicious. That alone will do it. 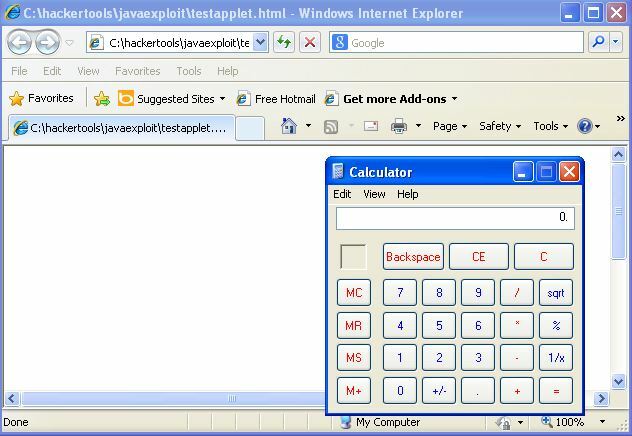 Run your HTML file, and your calculator will pop up. Congrats, you successfully exploited the vulnerability! The next step was to make this a command line prompt. Remember, I had command line as a lower privileged user already. I was hoping to run commands inside this program to be higher privileged. So the next step was to strip away all the Java applet stuff. Calculator should pop up! Not so exciting, but you can see it is working. In order to see who is actually running it, you can just have it run “whoami.exe” or something along those lines. Had it actually worked, I would have made it run a netcat listener or a meterpreter payload or something. What if I just want a .jar file? Bingo, now you can just run the jar file. Enough Java for one day. This entry was posted in Uncategorized and tagged CVE-2012-4681, java, privilege escalation on January 22, 2013 by admin. New Java Exploits are raining! I’m going to use this post to collect some data on them. This entry was posted in Uncategorized and tagged CVE-2012-0507, CVE-2012-4681, CVE-2013-0422, java on January 21, 2013 by admin.